A little isolated way out in the Atlantic Ocean, Iceland is known globally for its spectacular volcanic scenery, friendly population and regular bouts of geothermal activity – the most notorious of which grounded all European air traffic in 2010 after the eruption of the Eyjafjallajökull volcano sent a huge cloud of ash into the atmosphere. These fleeting impressions are pretty much all I had when my father invited me on a cycle trip across Iceland. Had he told me about the glaciers, endless climbs and general lack of tarmac, I may have been a little more hesitant. But he didn’t, so I went along for the ride. After setting out on two wheels from Keflavik airport, something I learned very quickly about long distance cycle expeditions is that however important fitness and mentality are, you must be adequately prepared. Otherwise things are going to become difficult very quickly. For example, I had just in the first few days come to realise how important our panniers were going to prove. As our adventure was going to take us right across the barren volcanic deserts in Iceland’s centre, it was vital that we could carry not only our clothes and tents, but all of our food as well. For this reason, we each had four panniers – two on each wheel – which were filled to the brim with thermal underwear, peanut bars and tinned sardines, among other things of course. After a quick visit to the world famous Blue Lagoon, our first major stop was the geothermal valley of Haukadalur, home to one of Iceland’s ‘Golden Circle’ of attractions. There you can see the famous Geysir, a huge hole in the ground which spouts boiling water up to 50m into the air. Unfortunately, Geysir is now rarely active; it normally takes an earthquake or two to stir it into life, rendering it little more than an impressively large jacuzzi for most of the time. Its neighbour Strokkur is much more obliging, and a great place to witness one of nature’s most impressive spectacles. The second of Iceland’s Golden Circle is the mighty waterfall of Gullfoss. I swear that we could hear it roar about 20 minutes before we actually saw it. I don’t like to admit it, but it didn’t take long for irrational feelings of hatred towards all other, non-cycling tourists to develop. In taking the two-wheeled option, I felt like I was really going the extra mile to experience Iceland, and that as a result I was more deserving of the incredible landscapes I was passing through. Most tourists were shipped in by the busload, driven to and from each sight, stopping for a while to wander round and take some pictures. We were regularly passed by big coaches. Those on board glanced out with expressions ranging from pity to awe, while I would sit exhausted by the roadside, forcing down another sesame seed bar – looking fantastic in my orange lycra of course. Heading generally northwards, we took the spectacular Kjölur road through Iceland’s interior highlands. The road was pretty much just a bumpy gravel track, so I was extremely grateful for the front suspension on my bike, as well as the cycling gloves I had taken with me. After around a week of difficult weather, breathtaking scenery and dirt roads we finally made it to Iceland’s northern coast, where we stopped for the night in the apparently sleepy town of Blönduós. According to our map, just outside was a large field where we could set up camp for the night. From a mile or so away we could see that there was steam rising from the area we were heading toward, which was a great sign. We’d already had a few dips in natural hot springs on the way, which is as good as it gets when you’ve been cycling for 12 hours straight. But we were wrong – it wasn’t another hot spring. As we got closer we were stopped at the gate and told that the campsite was being used by the Icelandic Motorcycle Society for their annual meetup, but we could still camp if we wanted. We walked tentatively in with our bicycles, looking pretty out of place amongst hundreds of leather clad, hairy and rather intimidating bikers. The steam we saw on the approach was actually an industrial vat full of lamb stew, which turned out to be the nicest meal of the whole trip, whilst any anxiety about being surrounded by scary bikers quickly went away as we and our bicycles were accepted with open arms. It’s all two wheels, right? A night of heavy drinking followed, and I vaguely remember too much Icelandic schnapps, eating Hákarl (a DISGUSTING, traditional snack made of fermented shark), several proposals from large Icelandic women and getting lost in my own tent. The less said about that the better. On the return route, we took the Kaldidalur road across the desolate Icelandic highlands, skirting past the country’s second largest glacier, Langjökull. The scenery was breathtaking, and after another week of riding south through volcanic deserts we came to the third of Iceland’s Golden Circle attractions, the Þingvellir National Park. The park is famous as the birthplace of the Icelandic parliament, and also has huge geographical significance as a result of it being on the border between two tectonic plates. The Silfra fissure in particular is world famous for its scuba diving, whilst you can also walk through in the canyon that runs through the park. Next we headed to the capital city of Reykjavík, where we relaxed a little, went on a whale watching tour and generally just recovered from the thousand or so miles we had cycled. All in all it was an incredible journey, and our method of transport made it even more unique. 1. A map: We had a map, but got lost a few times anyway, especially in the more rural parts where the roads and signposting isn’t great. Take a map, or maybe even a GPS set (Nordic navigator, GPS and a case), because there aren’t an awful lot of people around to help with directions. You might also find useful some apps like Iceland GPS By CITY APP or CoPilot Premium Nordics By ALK Technologies, Ltd.
2. A bike: No cycle trip would be possible without this. 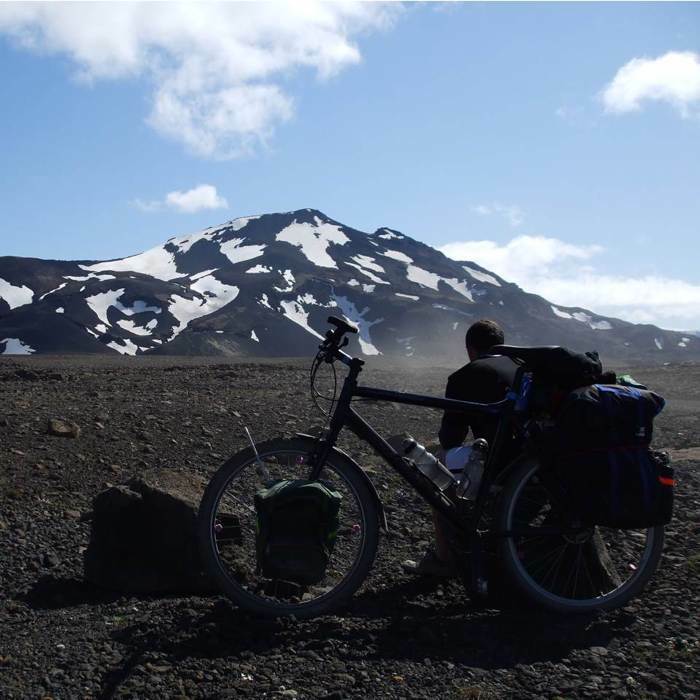 For Iceland you’ll need suspension, ideally front and back, along with room for panniers to carry all of your stuff. 3. Cycling gloves: The roads can get bumpy, which puts a lot of pressure on your hands, especially when you have to grip tightly. Get some gloves to avoid blisters. 4. Panniers: These are the most important thing. Without the ability to carry everything you need on your bicycle, you won’t get very far at all. Consider various options like these or these. 5. Cycling shorts: You can buy shorts with special padding in the bum region. You’ll need all the padding you can get if you plan on spending 12 hours on the saddle each day. For example, men’s shorts and underwear and women’s shorts. 6. Sunglasses: The light of Iceland’s summer was incredible, so be sure to take some sunglasses with you for the journey. 7. Lip Balm: The weather can be unpredictable, but if there’s a lot of wind then you’ll need balm to keep your lips from drying out. 8. Toilet paper: There aren’t any toilets in the highlands. 9. Hand sanitizer and antiseptic. 10. Headlamp or a simple torch. And extra batteries! 11. Tent and sleeping bag: Whilst there are some huts you can stay in along the route, it’s best to take sleeping equipment just in case you need to use a campsite. Sometimes there will be nothing, so a decent tent is a must. 13. Clothing: This is tricky. It’s important not to over pack when you have to carry everything with you. Having said that, you’ll need waterproofs, thermal base layers and more, especially if you want to look a little trendier once you reach the capital. 14. Food: For the majority of the trip there were no supermarkets or places to get food, and as a result we packed everything and took it to Iceland. When you’re exercising so much you need a lot of calories to keep your energy levels high. Our diets consisted mainly of some protein bars, nuts, porridge, fish and chocolate.